Valentine’s Day may still be a month away, but it’s never too early to start making heart-felt ornaments to decorate your quilt studio. This is a project that only uses a bit of fabric, batting, and ribbon or trim for the hanging loop. Once you have these materials assembled, it’s time to go to your sewing machine to stitch it up. I used the monogram feature and decorative stitches on the Janome MC9400 to embellish a sweet heart ornament. It’s easy to do and so fun to personalize by creating the phrases that are most “Valentine-y” to you. 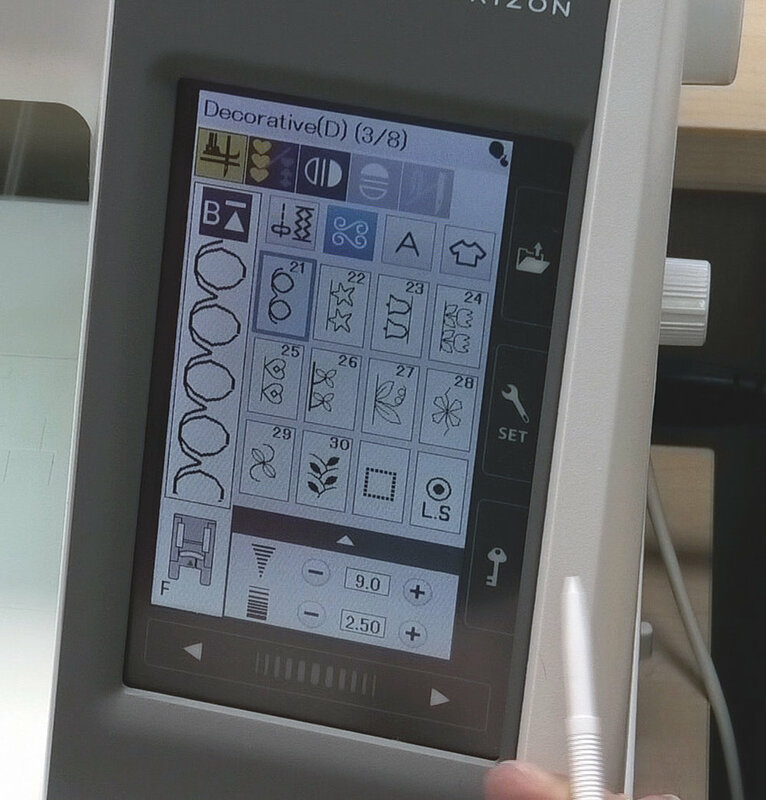 To learn more about using these features on the Janome MC9400, click here. I recommend that you create and stitch out your phrases on a trial piece of quilt sandwich so you’ll be sure that they are exactly the way you want them to be before stitching them on your “real” ornament. I created “XOXO” (hugs and kisses), “Kisses” and “Sweetheart” with the monogram feature on the Janome MC9400 to use on my ornament. I stitched these out in various fonts until I found the ones that I liked the best. I was then all ready to add them to my heart ornament. With several hundred decorative stitches available to use on the Janome MC9400, it was tough to determine which ones I wanted to use, so I kept it simple: I used some hearts (D13) and then chose one of the stitches in the Decorative category (D21) for the edge stitching. While it’s easy to get carried away with the decorative stitches, try not to do this or you’ll lose the effect of them on this size of ornament. For this project, simple is the best way to go. 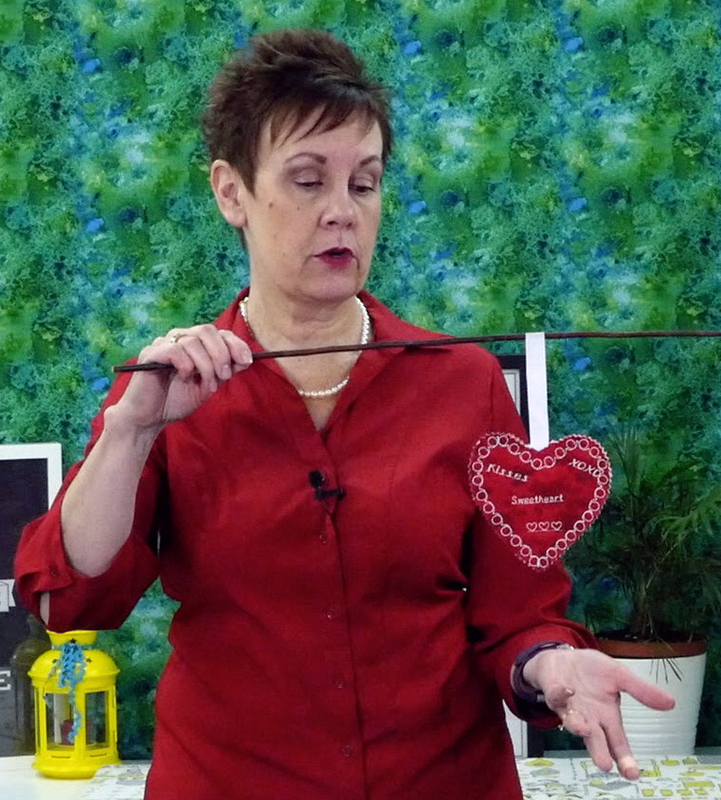 For all the details on how to create your own heart ornament in time for Valentine’s Day, click on the image below for the video tutorial. What words or phrases would you use on your Valentine’s Day ornament? Let me know in the comments below. P.S. Do you want to enhance your quilting and connect with other quilters from around the world? If you answered “yes” to this question, you need to join The Quilter’s Way. The Quilter’s Way is the only quilting membership site that includes both training and an active, supportive online community. Don’t wait another day! Join now.